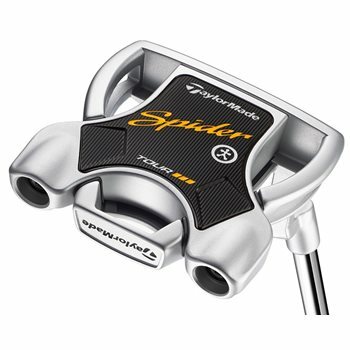 The TaylorMade Spider Interactive combines the performance of the Spider Tour putter with real-time stroke analytics captured by a BLAST Motion Sensor for a new way to improve your putting. The Spider Interactive automatically syncs valuable stroke data directly to your mobile app so you can analyze, refine, and master your putting. The mobile app gives you access to valuable insight, training levels, pro tips, and drills so you can monitor your practice, identify trends, and improve putting. The Spider Interactive “L” Neck has a 21° toe hang, full shaft offset, and single sightline.